In addition to being a commercial hub and known for its oil reserves, Dubai is also one of the most mesmerizing tourist attractions in the world. Every year, Dubai attracts a large number of vacationers and holidaying tourists from across the globe, especially during the Dubai Shopping Festival. Popularly known as one of the seven emirates, Dubai is also one of the most highly populated states of the United Arab Emirates (UAE) and about the second largest in size. It is situated within the Arabian Desert, sharing its borders with Abu Dhabi, Sharjah and the Sultanate of Oman. Dubai’s northern region is known as Deira and the region in the south is called Bur Dubai, joining the Jumeirah region along the coast. Summers are generally sunny, hot and humid while the winter months are mild near the coast and pretty cold close to the desert and mountains. Dubai doesn’t get much rain except for a few days during the year. The Dubai Museum is the most important Museum of Dubai and a visit here is highly recommended if you want to get a glimpse of Dubai’s culture, heritage, and history. Housed within the Al-Fahidi Fort, this Museum was opened on 12th May 1971 by the ruler of Dubai as a means to showcase day to day lives of people here. Artifacts on display include archaeological remains such as pottery and stone engravings, musical instruments, weaponry, and architectural masterpieces, etc. Now a museum, the Sheikh Saeed Al Maktoum House is a national monument that was originally built in 1896 by the ruler Sheikh Saeed Al Maktoum’s father. Sheikh Saeed was the ruler of Dubai from 1921 to 1958. Over the years, several restorations have been carried out in the newly built 30 room house which includes carved teak doors and windows etc. A visit to the Sheikh Saeed House will give you an opportunity to see Historical Photographs and Documents of the Emirate of Dubai along with photos of boat building and fishing in the Marine Wing. Spanning 55km, the Shaikh Zayed Road is a very impressive stretch in Dubai from the Dubai World Trade Centre roundabout to the Abu Dhabi border. Here you will find buildings like the Emirates Tour Office. If the thought of sun and sand makes you excited, you’ve got to spend a lazy day at Dubai’s popular Jumeirah Beach. Located along the Jumeira Road, the Jumeirah beach offers plenty of opportunities to indulge in some beach activities. You can pick from a host of activities such as scuba diving, jet skiing, etc. If you are visiting Dubai along with your children, they would love a visit to Dubai’s Wonderland Theme Park. In addition to a number of fun rides, families can also enjoy spending time at the family entertainment centre. 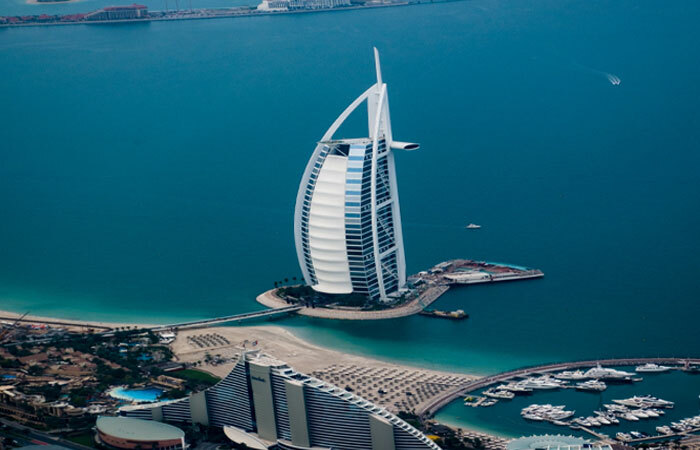 Beauty and luxury personified, the Burj Al Arab hotel is a landmark hotel representing one of the most awe-inspiring structures the world has ever seen. Located on Dubai’s coastline, the hotel is designed in the shape of a sail with a height of over 321 metres, making it the world’s tallest hotel. Its beauty becomes ever more unbelievable at night when there is a show of lights and fire, given the hotel its own unique identity across the glittering Arabian Gulf and Dubai’s skyline. With over 202 luxurious and well-equipped suites, the Burj Al Arab promises to offer you a stay of a lifetime. Some other well-known hotels in Dubai include Atlantis, The Palm, The Royal Mirage Hotel and The Al Maha Desert Resort and Spa Hotel. A visit to Dubai is incomplete without a shopping spree at the Deira City Centre Mall, located close to the waterfront in Deira. No matter what you’re looking for – clothes, jewellery or textiles, the 350 well-stocked shops here will offer you plenty of choices. In addition to shopping, you can also enjoy a scrumptious meal at the Mall’s restaurants and spend some fun moments at the entertainment centre. Other popular malls include The Mall of Emirates, Wafi City Mall, and the Dubai Mall. If you have a thing for Gold, you’re in luck! Dubai’s Deira Gold Souq is a very popular destination for gold shopping. Here you will find very famous shops selling a wide variety of gold jewellery – earrings, bangles, necklaces, anklets, chains, pendants and more. Your experience of Dubai cannot be over until you feel the thrill, fun, and adventure that Dubai’s Desert Safari has to offer. The sand dunes are every bit dazzling as you go up and down them in a 4 wheel drive of a lifetime! For those of you who want to go on a ride that is out of the ordinary, the ship of the desert awaits you. Watching the desert sun setting beyond miles and miles of sand is an experience in itself. If you are an ardent shopper and love to shop, it is best to plan your trip to Dubai during the world famous Dubai Shopping Festival! For years now, Dubai has been attracting large crowds of tourists and discerning shoppers to this much-awaited shopping extravaganza. No matter what you’re looking at, you will find it here in the sprawling malls of Dubai, especially during the festival. So what are you waiting for? Plan your next holiday to Dubai and experience its myriad shades. It will be a ride of a lifetime!